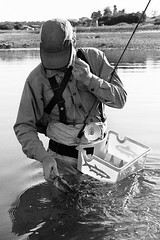 I have used the Riverwalker Sticky Rubber wading shoe since it came out. It is the best all-around wading shoe I have seen in over 30 years of wading rivers. Here is a little trick I have been using on really nasty bottoms or snow and ice. Get some 3/8" sheet metal screws and screw them into the center (highspot) of the star design on the shoe bottom. You'll need 5 or 6 on each shoe. Place 3 around the ball of your foot and then 2 or 3 on the heel. They go in easily and if you want to remove them, the hole is self-sealing after removal. Love the Sunshade Shirt! Have bought all three colors! Comfy and it works. It feels heavy at first, but when you start to prespire a little, you cool right off as the sweat evaporates. No UV worries either. Great baselayer piece on a cool morning under a jacket, too. SWEET! I'm glad to hear that we've risen to the top of your 30 year boot trials with the sticky rubber star tread. Just an FYI, check out the Sticky rubber sole post in the March archives. It contains similar dialogue and a visual of my screw-in stud set up. Regarding the Sunshade Shirt, all of us on the Patagonia fish team couldn't be more proud of this style. Look for a women's version soon!